Yorkshire is a walker's paradise and this book contains 100 of the best walks to suit all abilities. The North York Moors and Wolds offer a diverse range of walking opportunities to suit all abilities. In this book, we chart 25 of the best pubs within the Yorkshire Dales and find out why they have become a beacon and pull to so many over the years. The Yorkshire Dales is one of the most diverse and rich landscapes in the British Isles. Limestone interlaces with sweeping and rolling fells and dramatic peaks arise from its plains. England’s greatest county boasts an incomparable range of iconic features, set within such diverse regions as the Yorkshire Dales, North York Moors, South Pennines and Yorkshire Wolds. 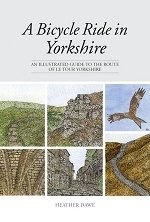 Inspired by Yorkshire’s wonderful landscape and history A Bicycle Ride in Yorkshire is an illustrated guide to the route of Le Tour Yorkshire, by cyclist, writer and artist Heather Dawe. These walks visit famous landmarks such as Malham Cove and Goredale Scar and the subsidiary valleys including Ribblesdale, Clapdale, Twisleton and Dentdale. The Western Dales offers both easy and more challenging walking in the magnificent limestone surroundings with valley walks, waterfalls in abundance and an ascent of the magnificent Ingleborough. The Coast to Coast Walk, devised by Alfred Wainwright himself, is the country's most loved long-distance walking route. Based on a collection of features that first appeared in the Yorkshire Post and featuring several of the characters who appear in the ITV1 prime time television series, The Dales, A Day in a Dale captures the experience of a series of memorable days out which can be shared by all either through reading, as an armchair traveller, or re-creating the journeys in person. Discover the best of North Yorkshire by foot with this beautifully presented, slim line walking guide exploring 50 of the regions best routes of 2 to 10 miles. Discover the best of the Yorkshire Dales on foot with this beautifully presented, slim line walking guide exploring 50 of the regions best routes of 2 to 10 miles. Discover the best of West Yorkshire foot with this beautifully presented, slim line walking guide exploring 50 of the regions best routes of 2 to 10 miles.